New chime candles have arrived! A brand new brand from India! 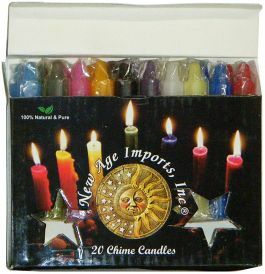 New Age chime candles are all natural and pure, and burn away cleanly with very little wax left behind. The colors are bright and vibrant, and each candle is individually wrapped in plastic to help protect it from scratches or the color from fading. They come in the usual sets of 20 candles, but the most exciting arrival is the mixed assortment box! It comes with two each of all 10 colors of the New Age candles! It’s the first candle assortment that we’ve had. You can check out all our candles here. This entry was posted in candles, Uncategorized and tagged assortment, candle, chime, new by River Village. Bookmark the permalink.